Computer-generated image of Edgbaston extension through Broad Street. Transport for West Midlands (TfWM), the public body responsible for public transport planning in and around Birmingham, will take over the operation of Midland Metro light rail services when the current concession runs out in 2018. Midland Metro has been operated by National Express since 1999. TfWM announced today (March 22) that rather than awarding a new concession to a private operator, it would bring the day-to-day running of the service in-house. TfWM has said the move will allow it to direct profits back into improving the network. It expects to generate £50 million in profits over the next 11 years. Extensions to the Midland Metro will triple the size of the network over the next decade or so. 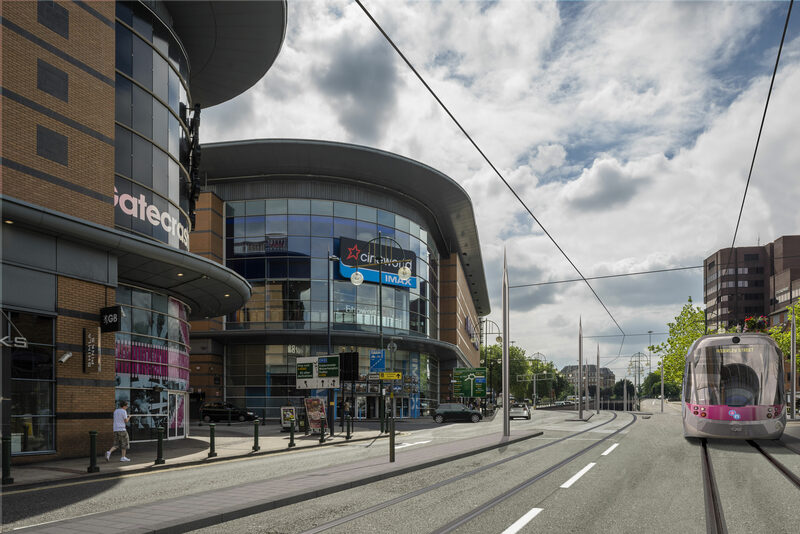 On March 17, the West Midlands Combined Authority (WMCA) approved the submission of a Transport and Works Act Order application for one of the next phases – an extension of the Centenary Square line to Edgbaston. Laura Shoaf, managing director of TfWM, said in a statement: “The end of the existing concession provides us with an ideal opportunity to change the way we operate services to better meet the needs of passengers, the wider community and ultimately the economy. Current National Express staff will be transferred to a new subsidiary, Midland Metro Ltd, when the concession ends in October next year. Colin Saward, general manager of National Express Midlands Metro, said: “It’s disappointing we won’t get the chance to run the tram service when our current contract is up next year. But we appreciate TfWM’s reasons for taking services back in house when the network is about to change so much.